The form in the OP is reopened for anyone wishing to order an extra. I'll message you if you submit for an option that is unavailable. Anyone thinking of designing an Alps plate (WKL)? If so, I would like to join. I'm making an alps plate but for standard with an AEK bottom row. I've already done some of the work making this so as long as the man Quan's okay with it we can do it. Here's a picture of what I've got so far. If there's more interest I could add MX stabilizer holes. I don't know Geekhack ettiquate is it incorrect to discuss this here? Apologies quan if I've overstepped. EDIT: Added spacebar MX cutouts as i'm using a spacebar with MX stabilizers. So I've filled out the form for one of the extras, but have not received an invoice for it yet. Is that coming later, or should I have expected it already? I would be down to purchase a Alps plate as well so count me in. All invoices for extras have been sent out. I see that I sent one out for you specifically as well. Contact me via PM or Discord so I can double check that the email I received for you was correct. I only just submitted today. Am I still able to get one? You're right...I'm dumb. I found the invoice and made the payment. Thanks for replying! Everything seems to be set. Is there still spots left? Taking a look at the spreadsheet and not sure if it's updated or not. I'd imagine if the forms still open then there are still spots left. Update: The manufacturer is set to receive the bulk raw material in the coming week and then machining can begin shortly after. If you are interested in purchasing a board here are the kits that are still available: https://docs.google.com/spreadsheets/d/1YttqhwpyjsRi2hG0m7JBProIy4jf3-8hZKvHRRYH4vs. If you do not see a color that means a color can still be chosen. After the end of this weekend, boards will no longer be available at GB price and will change to $300 (previously $250) for a base kit (Top, Bottom, Weight Plate). Oooof I made it in! So excited for the blue gray to come in! All paid up! Glad I made it in. I'm not the man himself but the form is still open and the google doc still says there's spots so i'd say go for it? Wh0000p that's a fast reply Hot damn. I'm very excited for the board/I just got lucky with refreshing geekhack at the right time. Hello fellow QXP friends I mentioned above i was working on an alps specific plate just wanted to give an update on that. I've got a prototype in which you can see below. Upon immediate inspection i'm really happy with it the alps clip in great and it looks fantastic. The next step will be confirming all the switches are in the right location and hopefully, Quan willing, i'll get a chance to check whether it properly mates with the case prototype. I would definitely be up for one if its HHKB compatible. My orange alps are still waiting for a HHKB Alps board and this would be perfect. At this point it's more of an issue of figuring out what layout a majority/enough people would be interested in to make them. AEK! My distant second preference would be Winkey with Cherry stab on SPC in order to use Taobao keycaps. I feel aek would the easiest but with me having the hhkb case i would want that. But I have to ask, how do you go about spacebar foe that with a 7u? Not sure if we really get enough people to like one layout. 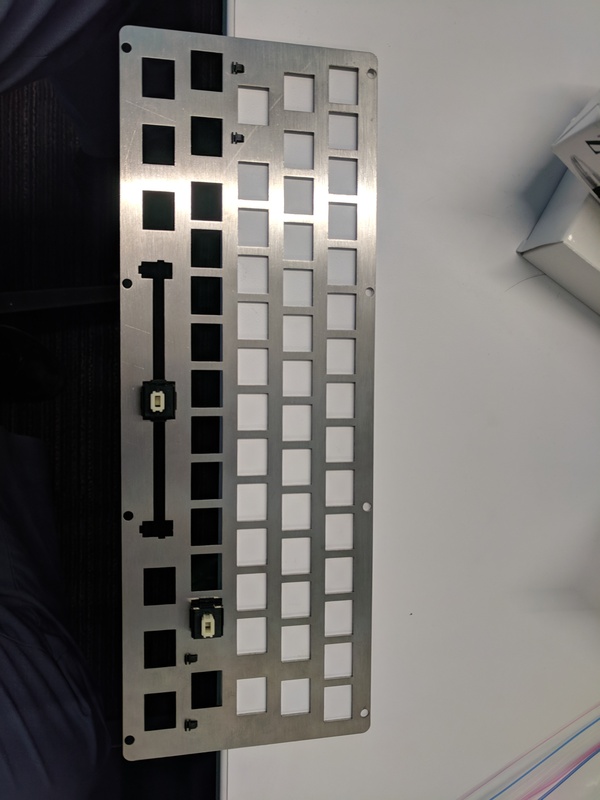 Some people want standard aek, others with mx space bar, there are so many options with alps and multi layout plates are nearly impossible compared to mx plates. I hope we can get the plate files open sourced so that everybody can make his own layout plate. From what I've heard https://www.laserboost.com/ 60% plates are around 40$ shipped to the US, to me that sounds like a valid option for alps interested people. And for EU people like me this may even be the better option compared to expensive US>EU shipping. I personally would probably be interested in a standard aek plate, but as shipping from the US is probably 14$ alone + taxes, I'm not sure if I really commit to that as my primary build will be with mx switches. Btw: is there any update about production? Is the cnc work already done or did it already move to the anodizing company? Good to hear Which discord do I have to join or can someone reupload the pictures here? Latest update: CNC is completed for all of the boards. They are being prepared with a final step before they go to anodizing. I'll keep you posted when I have more info. There are still a few boards unclaimed so check the Order Check link in the OP. Rows in GRAY are boards that are available. Thanks for the update Quan! Any chance for a leak of a photo? Filled in for a spot! This will be my first WKL 60%. When is this estimated to ship? CNC done and waiting for ano. So probably pretty soon. oh cool. I'm guessing anodizing goes pretty fast? I wonder if Quant mentioned any timeline for this. Maybe like august? Last I heard was "Soon^TM". Thanks for the updates, Quan! Can't wait for this WKL goodness. Finally pulled the trigger on this. Hope I can grab the spot I want. Great looking board at a great price! Any extra alu hhkb/wkl plates? I would be interested depending on the layout supported. My Ideal layout is HHKB layout using AEK standard bottom row as I have a M0116 to fill out the proper compat I need. I would also do the 1 - 1.5 - 7 - 1.5 - 1 bottom row w/ cherry stabbed spacebar if anyone has a link to where they are readily available. Filled in for a spot... Am i too late though? Any sweet pictures to hold us off? Page created in 1.053 seconds with 71 queries.